Hulking hero Hercules is one of the most popular figures to come out of Greek mythology. He has had several incarnations over the years, being presented in literature and more recently TV and film to great success. 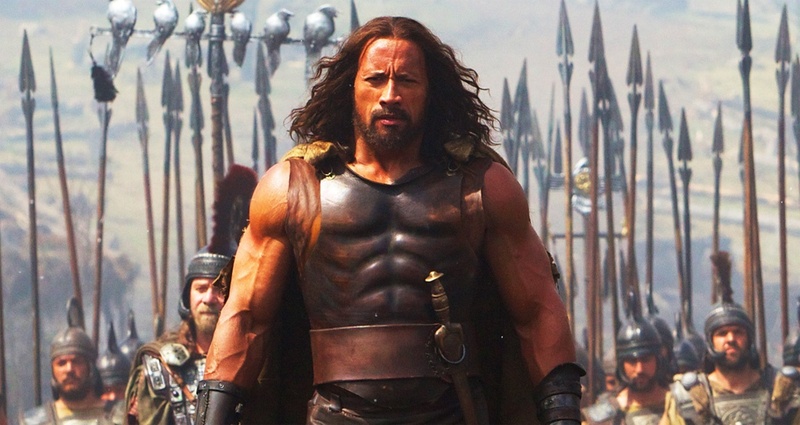 Summer blockbuster Hercules, featuring Dwayne 'The Rock' Johnson, is due out at the end of this week, and it has prompted me to think about some of the memorable portrayals over the years. Greek demigod Hercules (or Herakles to the ancient Greeks) was a popular figure in ancient culture – with many stories told of his 12 Labours in particular. The son of Zeus, King of the Gods, and a mortal woman; he had extraordinary strength. But his legend is filled with darkness – driven to madness by the jealousy of Zeus's wife Hera, Hercules killed his own children, and the labours he performs are his way of seeking redemption. As a warrior, he could be brutal at times, and even arrogant as portrayed in Homer's epics. The Romans, who assimilated much of Greek mythology into their own traditions also revered Hercules as a symbol of strength. The emperor Commodus (known in popular culture from the movie Gladiator) indulged his cruel streak by fighting in the gladiatoral arena, believing himself to be the reincarnation of Hercules. In more modern times, Hercules is a hero with a heart. First airing on TV screens in 1995, produced by Sam Raimi and starring Kevin Sorbo as the titular character, Hercules and his 'sidekick' Iolaus typically spent their time saving villagers they encountered from monsters, gods or evil warlords, and battling against the main villain Hera (as typical of the ancient myths); though as is the nature of long-running shows, new antagonists were introduced. 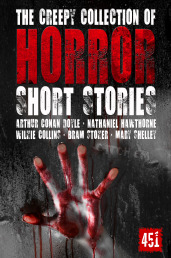 Plenty of action and plenty of comedy – particularly with knowing asides about modern topics – it was a thoroughly enjoyable sword and sorcery type adventure. Hercules was the sort of hero who would save your life and then take you for a drink afterwards - an all-around good guy, with a great comedic partner in Michael Hurst's Iolaus. It was due to this series' success that similar genre shows were commissioned, featuring heroes such as Robin Hood and Sinbad the Sailor. This TV show also had two spin-offs – the infamous Xena: Warrior Princess, and the lesser-known Young Hercules, featuring future heartthrob Ryan Gosling as the young hero. Possibly my first major initiation to the character of Hercules, and a video I watched over and over as a child, Walt Disney provided an animated tale of Hercules in 1997. As a children's film, there were always bound to be changes to the darker side of our hero. The first major difference from Hercules' tale as we know it, is his parentage – Zeus is still his father, but Hera is now his mother. 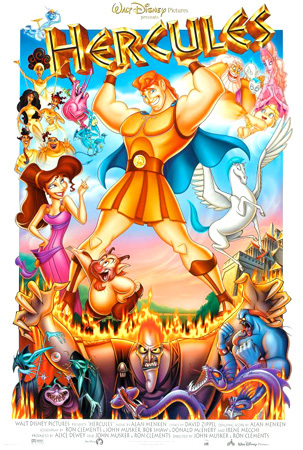 It is due to Hades' interference (who takes on the role of the major villain here), that Hercules is turned into a mortal, but still possesses superhuman strength. The movie follows teenage Hercules as he struggles to work out his place in the world, and falls in love for the first time with the sassy Meg, whom he later renounces his immortality for. This is the most innocent we have ever seen our hero. This year sees not one but two Hercules films, taking Hercules back to being a commanding presence. The Legend of Hercules, starring Kellan Lutz, was not well-received. Everything from the unoriginal script to the lack of pace have been criticised, and the young actor Lutz just may not have had the gravitas and gritty acting ability to deal with the emotional hardships – a counterbalance to the action that you need to have. Will The Rock's interpretation fare better? With his wrestling background he certainly has the physique and he's no stranger to action films, with such previous roles as The Scorpion King. 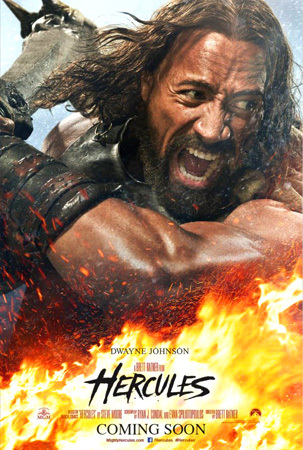 The plot of this movie takes place after Hercules' Twelve Labours, which likely means taking our hero into more re-imagined plotlines involving plenty of all-out action. While it looks like he could certainly play the grittier, darker side of Hercules; he's also a modest man, claiming 'I only want to be a husband and a father,…I am no hero.' It features such British talents as John Hurt, Ian McShane and Joseph Fiennes, so there may be some credible acting too. If you want to know more about the original tales of Hercules, why not read about him in our Myths & Legends book, general editor Jake Jackson (ISBN: 9780857758491). 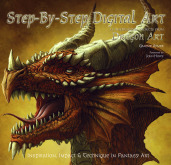 Have a look on Amazon here.